Bayhurst Woods is off Breakspear Road North. Breakespear Road runs from Ickenham to Harefield. Driving North towards Harefield the Festival site is on the right, just past Willow Tree Camp on a tricky left hand bend in the road. Directions on how to enter the site will be displayed on the day. 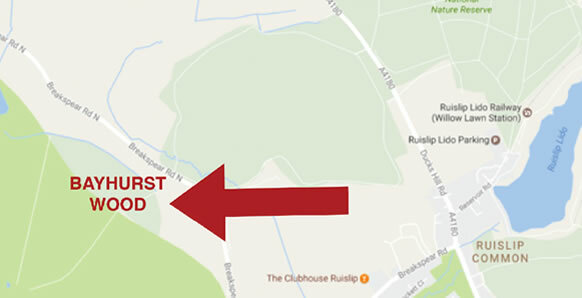 For the Festival parking will be in the large field in front of the Woods and the entrance will be well signposted on the day. There will be temporary toilets on the day of the Festival and plenty of places to stop and rest and picnic.